Circulation is critical to a healthy body. If you’re suffering from poor blood circulation, even simple everyday tasks can become more challenging. Fortunately, you can improve poor circulation right now with these 17 helpful tips. Read on as we tackle all sorts of actionable and helpful ways how to improve poor blood circulation. Getting up and getting active is one proven way to increase blood circulation. No one is saying you need to train for a triathlon, either. Just twenty to thirty minutes of brisk walking a day is enough to get your blood pumping, which is why cardio exercise is one of the most recommended ways to improve treatment for poor circulation in hands and feet. Just get up and get walking! It’s that simple. When it comes to poor circulation symptoms, tingling in the legs is one of the most common. Since your legs are the furthest body part from your heart, it’s easy to see why it’s so common to have poor circulation in the legs. You can help get the blood flowing to the legs right now by doing some squats. Squats target the largest muscles in your legs, which gets the blood flowing to your lower body almost instantly. Stand straight with your feet shoulder width apart. Hold your arms straight out in front of you and tighten your core. Push your hips back and bend your knees to lower into a squat position. Hold the position briefly, then return to the position from step 1. Do three sets of 10-12 squats. If that’s too much for you, you can cut down to three sets of 5-6 squats. Few things are more relaxing than a soothing massage. Not only is a massage relaxing, but it’s also a helpful poor circulation treatment. As a massage therapist presses and pulls at your body, they’re sending blood through the congested areas of your body, which improves circulation. When they release the pressure on your body, this causes new blood to flood to the area, further increasing circulation. Massage also helps to release lactic acid from muscles while improving the circulation of lymph fluid, which helps relieve tension and muscle discomfort, all while increasing circulation. Find an experienced massage therapist. If you’re unsure where to look, try googling your zip code + massage therapist. Book an appointment and let them know you’re curious about how to increase blood flow through massage. Show up for your appointment and enjoy your massage while improving circulation. The benefits of supplementing your diet with Omega III fatty acids seem to be never-ending. In addition to all these benefits, Omega 3’s have shown an ability to increase blood circulation, as well. Omega 3’s are especially helpful at increasing blood flow to muscles during exercise, so it’s a great idea to pair an Omega III supplement or food rich in Omega III with your cardio routine. Purchase a local Omega III supplement at your local drug store and use it according to the directions on the bottle. Add Omega III’s to your diet from sources like salmon, broccoli, walnuts, and brussels sprouts. Do you still smoke? Quitting smoking is a healthy decision in general, and it can also help improve poor blood circulation. If you’ve ever seen pictures of poor circulation in feet or hands and wondered why the extremities look so discolored, smoking is usually the culprit. In fact, smoking-related circulatory diseases kill more people each year than lung cancer does, so put down the butts once and for all! Put a plan in place; it’s easier to quit smoking if you’re equipped with a plan for change. Consider therapy options such as nicotine replacement therapy, or prescription smoking cessation medications. Take the plunge and quit smoking! Medical professionals constantly talk about the dangers of high blood pressure, but did you know that low blood pressure also presents dangers, as well? People with low blood pressure are more likely to have poor circulation in hands while sleeping, in addition to several other circulation related issues. If your blood pressure is too low, construct a plan to raise your blood pressure to a normal level. Keep in mind, high blood pressure can also cause poor circulation, so it’s important to keep your blood pressure within an acceptable range for your height and weight. Consult with your physician about your blood pressure and what you can do to bring it into a healthy range. Make changes to your diet: eat a diet that’s higher in salt, limit alcohol consumption, drink more fluids and exercise more often. Follow up with your doctor to chart your progress. Wondering how to improve poor blood circulation? With Yoga of course! Starting a yoga routine will help increase blood flow throughout your body while also helping you to de-stress and reduce tension and anxiety. Yoga, in general, helps improve circulation, but some poses are especially helpful. To improve circulation, try the chair pose, mountain II pose, downward dog, triangle and yoga lunge. Compression garments, especially compression socks are another great way to improve poor blood circulation. Like a good massage, compression socks can help improve blood flow to your legs and other extremities, making them a quick and affordable way of how to improve blood circulation right now. Beyond increasing blood flow, compression socks can also help prevent blood clots, reduce swelling, and improve the condition of venous diseases, as well. Visit your local drug store and pick up a pair of compression socks. If you’re not sure which pair is best for you, ask the pharmacist. 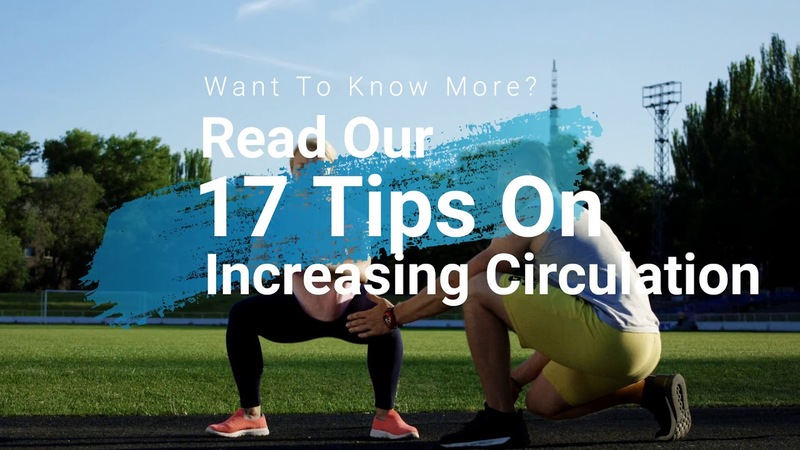 Wondering how to improve circulation? A nice warm bath is a great place to start. The warm water causes your veins and arteries to expand, providing more room for blood to flow throughout your body. Add a bath bomb or light some candles to relieve stress while you relax. Soak yourself for 20-30 minutes. The dangers of stress are well documented, but did you know that stress can also cause poor blood circulation? Stress raises blood pressure, which can cause poor circulation. While it’s not easy to eliminate stress from your life, there are some easy steps you can take right now to make it happen. Some things you can do include learning to accept things you can’t control, spending more time with loved ones, and incorporating stress-reducing supplements like kava kava or valerian root to your diet. Create a plan to decrease stress in your life. Consider trying yoga, taking up a new hobby, or just setting aside a daily relaxation period for yourself. Sitting down makes it more difficult for your blood to circulate to your lower extremities. By standing up, you’ll make it easier for blood to flow to your legs, improving blood circulation in the process. Try and stand up more in your daily life. If you sit at work all day, consider a standing desk. Stand up while hanging out at home instead of loafing on the couch. Make it a point to get up and walk around for five minutes for each half hour you spend seated. One of the most tried and true ways to achieve better circulation is elevating your legs. Sitting for extended periods causes blood to pool in the legs instead of returning to the heart. Elevating your legs can help kickstart blood flow for immediate results. Use an ottoman when sitting down. Place a pillow under your legs when you sleep. Lie down on your floor with your buttocks against the wall, and raise your legs up the wall. While a drink a day may help keep the doctor away, drinking more than that is a recipe for poor circulation. One way how to increase poor blood circulation is to take it easy on the booze. Too much alcohol decreases blood circulation and can lead to several health complications, including heart disease. Spend less time with friends who like to drink too much. Just like a bath can help dilate blood vessels and veins thanks to the warmth of the water, tea can do the same thing. Enjoying a cup of tea helps widen the pathways for blood to travel through your body, which is one way how to increase circulation. Find a flavor of herbal tea you enjoy drinking. Earl Grey, jasmine and green tea are popular options. Heat up some water, add a tea bag, and enjoy! When we’re well hydrated, our blood has an easier time circulating throughout your body. If you’ve never been one to make sure you’re drinking plenty of water throughout the day, now may be a great time to start. If you’re a coffee drinker, you may want to try and cut down as well. Caffeine has a diuretic effect, which dehydrates the body. So, while you may be thinking that coffee is mostly just water, it actually has the opposite effect for your body that a tall glass of h2o does. Make it a point to drink more water throughout the day. Consider buying a smart water bottle, which will alert you when it’s time to drink more water. When it comes to what causes poor circulation, there are several different contributing factors. One way to address them all and improve blood flow is by dry brushing. By brushing your body with a dry brush each morning, you’ll increase circulation while shedding dead skin cells and encouraging new cell renewal. Pick up a dry brush at your local drug store. Run the brush along your skin from head to toe each morning. Iron is a critical mineral that has several health benefits. Most importantly for improved circulation, iron is an essential element in hemoglobin, which helps transport blood throughout the body. Eating iron-rich foods or taking an iron supplement can improve your circulation today. Eat more foods rich in iron, like seafood, spinach, peas, broccoli, and dark chocolate. The causes of poor circulation are many. Between our diets, our lifestyle choices, and maybe even the occasional vice here and there, we all do things that contribute to poor blood circulation. On the bright side, you don’t have to suffer from poor circulation any longer. Start by incorporating the tips above into your daily life. Each of these small changes will help increase blood flow to your body. If you’re still wondering how to improve poor blood circulation after that, contact the specialists at the Kistner Vein Clinic today to learn more about how we can help improve poor circulation, so you can focus on enjoying your life.